Genea-Musings: Amanuensis Monday - 1736 Non Compos Mentis Petition for Josiah Wood (1687-1753) of Woburn, Mass. 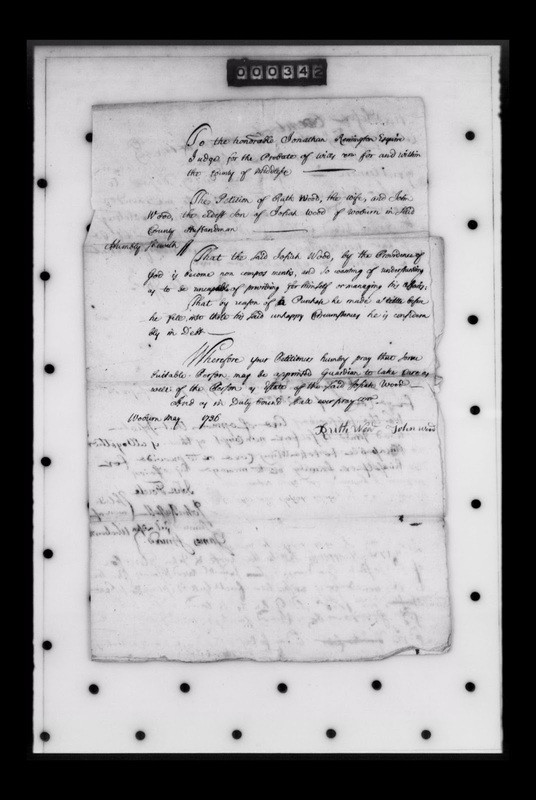 Amanuensis Monday - 1736 Non Compos Mentis Petition for Josiah Wood (1687-1753) of Woburn, Mass. as to become uncapable of providing for himself or managing his affairs. well of the Person & Estate of the said Josiah Wood. a Guardian be appointed for him. for ye County of Middl^x &c.
himself or family or to manage his affairs. ????? ??? ????? S^d John to be bound in s^d ???? p^d 12^s ? 6 ^s dm to Reg^r J R Jp ??????????????? 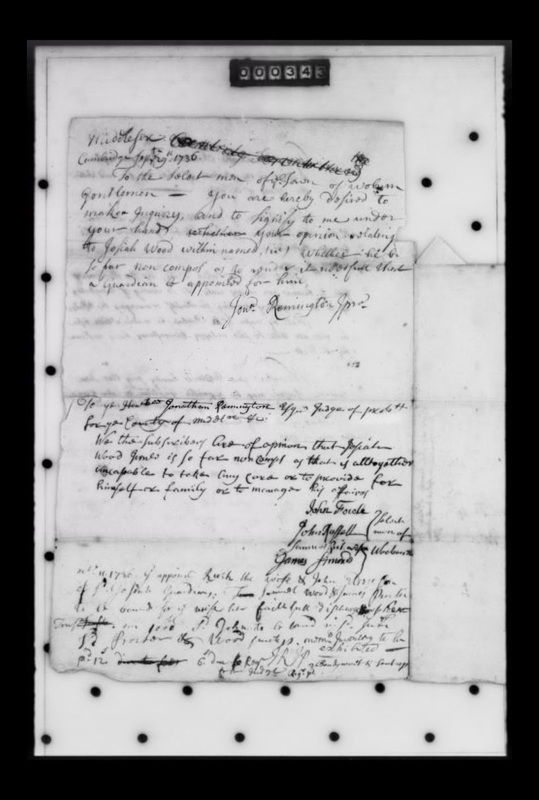 "Middlesex County, MA: Probate Papers, 1648-1871," digital image, American Ancestors (http://www.AmericanAncestors.org : accessed 13 August 2017), Probate Packet 25,489 (14 images), Josiah Wood of Woburn, 1736. In 1736, when Josiah Wood of Woburn was age 49, his wife and eldest son petitioned (image 1 above) the Middlesex County Probate Court to have Josiah Wood declared "non compos mentis," meaning not sane, or not in their right mind. At the time, Josiah and Ruth had eight living children, all but one of them (John) were minors. After receiving the petition, the Judge of Probate wrote to the selectmen of the town of Woburn asking their judgement (in image 2 above), and they responded saying they agreed that Josiah Wood was incapable of caring for his family or his affairs. The Judge then declared Josiah's wife, Ruth, and their eldest son, John Wood, to be Guardians for Josiah wood Junior (his father Josiah Wood was still alive then). The Judge requested that the guardians prepare an inventory of the real and personal estate of Josiah Wood. There will be several more posts about this set of probate papers - there are some interesting twists in the records. Josiah and Ruth (Walker) Wood are my 7th great-grandparents, the parents of Susannah Wood (1724-1780), who married Nathan Reed (1719-1802) in 1743. Now I want to know what the other surprises are!